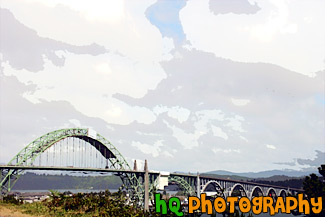 A scenic picture taken of the Yaquina Bay Bridge located near the Yaquina Head Lighthouse along the coast in Oregon State. This picture was taken on a day with interesting puffy clouds which filled the sky. This bridge is composed of five concrete support decks that lead to a dramatic, high-soaring steel arch. Each end of the structure has a pedestrian plaza with winding stairways that lead to lookout spots. Newport today is a bustling coastal community of over 9,000. It's heart is along a working waterfront on Yaquina Bay where fishing fleets and fresh seafood markets coexist with galleries, gift shops, restaurants and family attractions. Across the bay is the acclaimed Oregon Coast Aquarium and the Hatfield Marine Science Center. Historic Nye Beach, 2 lighthouses, museums and wide sandy beaches provide activity for people of all ages. A scenic picture taken of the Air Museum with low cloudy skies. 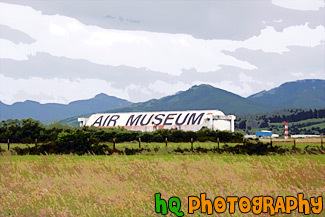 The Air Museum is located in Tillamook, Oregon. The Air Museum contains America's finest collection of over 30 War Birds including our P-38 Lightning, P-47 Thunderbolt, F4U-Corsair, P51-Mustang, PBY Catalina, B-25 Mitchell Bomber, and SBD Dauntless dive bomber. At the Air Museum you can also climb into a jet simulator, have lunch at their 40/50's Cafe or enjoy shopping in their aviation gift shop. All these things are housed in a rare World War II Blimp Hangar which is the largest wooden structure in the world. A scenic coastal picture taken in Oregon State at Cannon Beach. 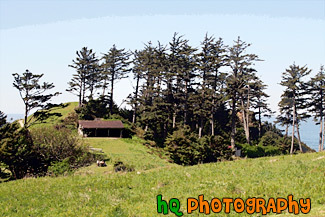 In this picture you can see sea stack rocks and the well-known Haystack Rock in the distance. 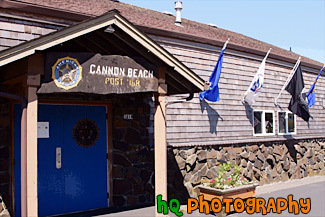 A scenic picture taken close up of the Cannon Beach, Oregon State post offfice building on a sunny day. 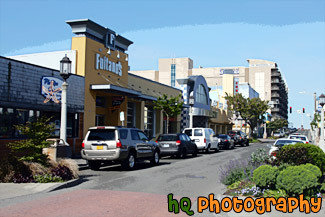 A scenic picture taken of the downtown area of Seaside, Oregon. Seaside is a tourist town located on the coast of Oregon. 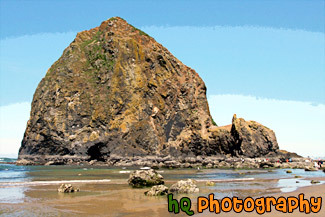 A scenic picture taken of the popular Cannon Beach landmark, Haystack Rock. This photo was taken from a hill looking slightly down at the rock. You can see all of the people below observing Haystack Rock. 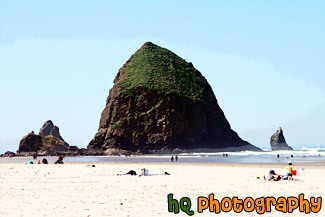 A scenic picture taken of Haystack Rock which is located along the shore at Cannon Beach, Oregon. Haystack Rock is a popular tourist location in Oregon State. 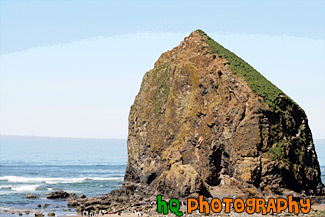 A scenic close up picture taken of Haystack Rock which is located along the coast in Cannon Beach, Oregon. You can see the birds landing on the rock as it is their home. 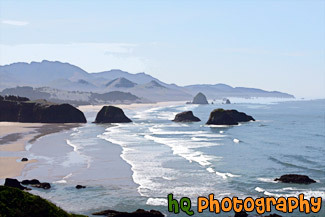 A scenic picture taken of Haystack Rock located along the coastal shore in Cannon Beach, Oregon. Haystack Rock is a dedicated and protected Marine Garden. It rises 235 feet and is abundant with sea life. 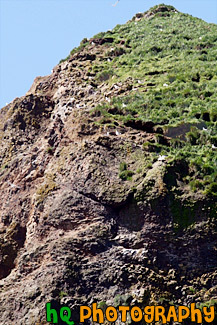 Haystack Rock is home to many birds such as tufted puffins, gulls, and cormorants. 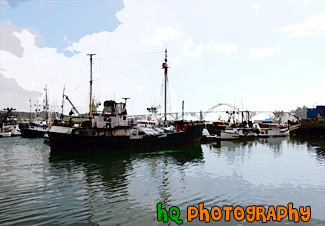 A scenic picture taken in Newort, Oregon of some sailboats and the Yaquina Bay Bridge in the background. This photo was taken with partly cloudy skies in late spring. 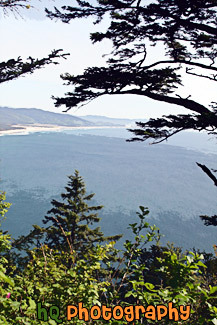 A scenic vertical picture taken of the Oregon State coast and Pacific Ocean looking down through trees from the top of a hiking trail. This photo was taken on a pretty blue sky day. 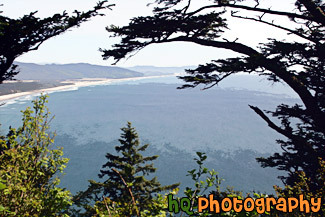 A scenic picture taken of the scenic Oregon State coast and the Pacific Ocean from a top a hiking trail on a hill looking down at the ocean and shoreline. This photo was taken on a beautiful sunny day. A scenic coastal picture taken along the cast in Oregon State at Cannon Beach. 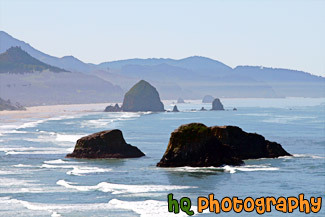 In this picture you can see a lot of sea stack rocks and the well-known Haystack Rock in the distance. Blue sky is seen above the Pacific Ocean. 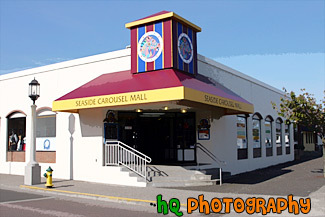 A scenic picture taken of the Seaside Carousel Mall located along the coast in Seaside, Oregon. The mall contains 20 unique shops surrounding a full size working carousel. 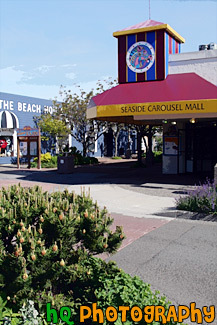 A scenic picture taken on Broadway Street located in downtown Seaside Oregon of the Carousel Mall and Beach House. A scenic picture taken of the boardwalk in downtown Seaside, Oregon on a beautiful sunny, blue sky day. The Pacific Ocean is seen in the distance. 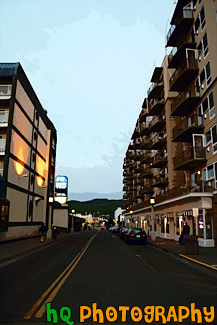 A scenic picture taken of downtown Seaside, Oregon just before sunset at dusk. The street lights and lights of the building had just started to come on. Seaside contains 3 miles of powder-soft beach and 2 miles of manicured, ocean front boardwalk which make Seaside a popular tourist town. 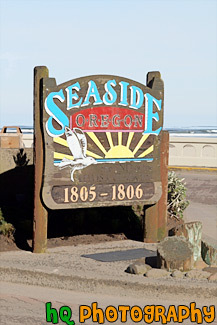 A pleasant 90 minute drive from Portland, Seaside is a first choice destination for north and southbound travelers. In Seaside you'll find dozens of delightful mini-malls, specialty boutiques, antique shops, art galleries, museums, arcades and cinemas. 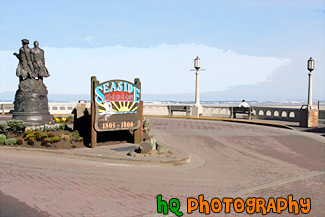 A scenic vertical picture taken of the Seaside Oregon sign located on the Boardwalk in downtown Seaside, Orgeon. The sign says "The end of the Lewis & Clark trail. 1805-1806." You can see the beach and the Pacific Ocean in the background. A scenic picture taken of tall trees located along the Oregon State coast located in a State Park right next to Cannon Beach. 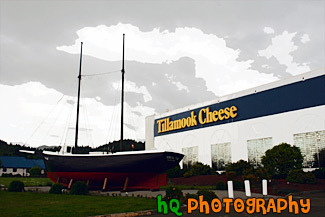 A scenic picture taken of the Tillamook Cheese Factory located in the city of Tillamook, Oregon. The Tillamook Cheese Factory is a farmer owned cooperative, and they take pride in continuing the tradition of quality cheese making which started a century ago. To this day, the corporation continues to produce top quality milk, dairy products and has a sound future for the farmers of our beautiful Oregon valley.